Yep, I’m moving! Some of you know where, others will find out in the next blog post. I wasn’t sure we could get everything to fit in the van, but we did. Believe it or not, I am only taking two boxes of yarn with me. See that pink box on the left in the photo? That’s one of them–can you believe my restraint? Where are you going?!? Off to school I’m guessing. What will happen to all your yarn that you’ve left behind? Good luck with the move! Well me us posted with your blog please. Good luck on your journey. ::sniff:: so long! can’t wait to read about your journey! What? Trying to avoid winter? Safe driving. What?!? You show remarkable restraint. I haven’t been able to move in a van in … well … never, I guess. What! Really? Gosh, I’m sorry I only got to meet you so briefly–have a great trip!! My, that is a lot of restraint! :) I didn’t knit back while I was in grad school, but I did have to set very strict rules with myself about reading for fun or I would’ve flunked out. Bon Voyage! Write when you get settled! Wow only two boxes of yarn! That is remarkable restraint. Good luck with the move and the trip. Oh my! Have a safe trip and hope the moving goes well. Wow, what a lot of restraint! 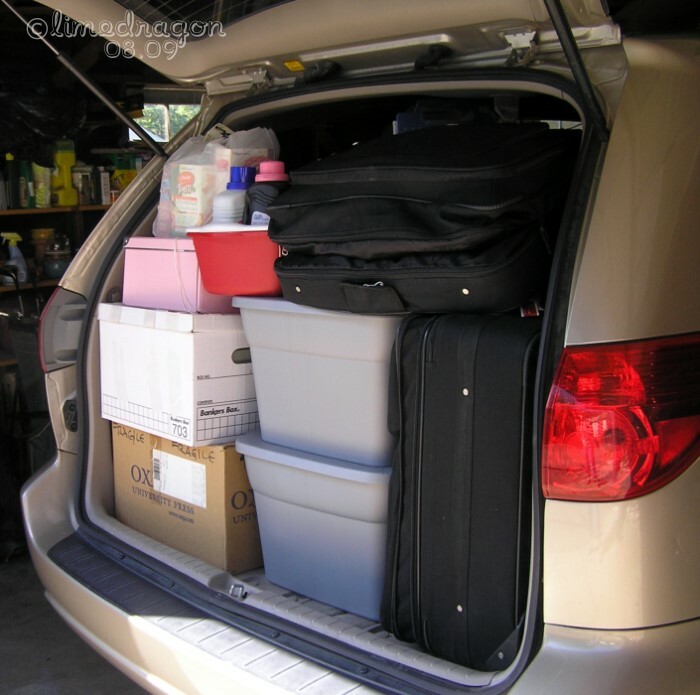 I am also amazed that everything fits in your car, ok van, but it’s not a moving truck. I would think you’d want to knit at school… I painted most of a house when I was writing my thesis… I found it relaxing, and it allowed me to procrastinate in a productive way, and also I mulled a lot over and I think in the end it helped with the writing! Wow! How exciting! Can’t wait to read what you’re up to! only two boxes of yarn? holy moses! you’re probably already there, so i hope you had a safe journey!